Malaysia Airlines Flight MH370 from Kuala Lumpur, Malaysia to Beijing, China was reported missing on March 8, 2014. There were 227 passengers and 12 crew members on board. The Boeing 777-2H6ER took off from Kuala Lumpur International Airport's runway 32R at 00:41. At 00:42 the flight was cleared to climb to FL180 and was issued a direct track by Lumpur Approach to the IGARI waypoint. MH370 was then transferred to Lumpur Radar and was cleared to climb to FL250. At 00:50 the flight was further cleared to the planned cruising altitude of FL350. MH370 reported maintaining FL350 at 01:07. Last radio contact was at 01:19 when the Kuala Lumpur Radar controller instructed the flight to contact the radio frequency of Ho Chi Minh Air Traffic Control Centre, Vietnam: "Malaysian Three Seven Zero contact Ho Chi Minh 120 decimal 9 Good Night". One of the flight crew members replied: "Good night, Malaysian Three Seven Zero." At 01:21 MH370 was observed on the radar screen of the Kuala Lumpur Radar controller as it passed over waypoint IGARI. Nine seconds later the radar label for MH370 disappeared from the radar screen. The transponder was switched off. At 01:38 Ho Chi Minh ATCC contacted Kuala Lumpur ATCC on the whereabouts of MH370. Kuala Lumpur ATCC contacted the airline's operations centre, Singapore ACC, Hong Kong ACC, and Phnom Penh ACC, failing to establish the location of MH370. Meanwhile, the airplane flew in a westerly direction back over peninsular Malaysia before turning northwest. Primary radar data showed that the aircraft tracked along the Malacca Strait. During this time the aircraft passed close to waypoints VAMPI, MEKAR, NILAM and possibly IGOGU along a section of airway N571. The final primary radar fix occurred at 02:22. From then on seven handshakes between the aircraft's SATCOM system and the Inmarsat ground station were recorded. Last satellite data was recorded at 08:11 Malaysian time. Initially search efforts focused on the South China Sea area. On 24 March 2014 further analysis of the Inmarsat satellite data indicated that MH370 flew south and ended its flight in the southern part of the Indian Ocean. A surface search was conducted of probable impact areas along an arc, identified by calculations based on Inmarsat data. The search was carried out from 18 March - 28 April 2014. This search effort was undertaken by an international fleet of aircraft and ships with the search areas over this time progressing generally from an initial southwest location along the arc in a north-easterly direction. No debris associated with MH370 was identified either from the surface search, acoustic search or from the ocean floor search in the vicinity of acoustic detections, which were initially believed to have been from the pingers on the flight recorders. The ocean floor search was completed on 28 May 2014. On June 26 the ATSB published a new search area based on refinements to the analysis of both the flight and satellite data. The priority area of approximately 60,000 km2 extends along the arc for 650 km in a northeast direction from Broken Ridge, an underwater ridge. The width of the priority search area is 93 km. On July 29, 2015 a flapperon washed ashore on the French island of Réunion in the Indian Ocean. On August 5 it was established to have been from MH370. Tthe Team is unable to determine the real cause for the disappearance of MH370. To review the existing coordination procedures/establish new procedures between KL ATSC and Joint Air Traffic Control Centre (JATCC) with regard to unidentified primary target observed by the Radar Controller. To review the present Duty Roster System for KL ATSC with the objective of improving the working conditions. To develop a comprehensive Quick Reference on ATC actions relating to aircraft emergency to be available at all Controller working positions. Air Traffic Controllers are to be provided refresher training to ensure established procedures are always complied with. To review and enhance the training syllabi of the courses for Lead-in and On-the-job training to include ATC actions during aircraft emergencies for ATS personnel at KL ATSC. To review and introduce more stringent security measures for cargo scanning at Penang International Airport/all airports and the point of entry into airside at KLIA/all airports. To review the privileging process of the appointment of the designated aviation medical examiners on a regular basis. To observe the provisions of the Operational Letter of Agreement between Civil Aviation Authorities of adjacent Flight Information Regions. To observe the requirement of Language Proficiency as outlined from the following document: d) ICAO Annex 1 Personnel Licencing Chapter 1 paragraph 1.2.9.2 Language Proficiency; ii) ICAO Doc 9835 AN/53 Manual on the Implementation of ICAO Language Proficiency Requirements Chapter 6 - Language Testing Criteria for Global Harmonization. To ensure that the flight crew report to MAB Flight Operations of any serious ailment that can cause medical incapacitation and therapy prescribed at MAB medical facilities as well as MAB-appointed panel clinics. To ensure that the medical records of the flight crew maintained by the MAB Medical Centre to include records maintained by different panel clinics. The complete medical record of the individual flight crew shall show all visits to any panel clinics, the details of ailments and therapy prescribed. 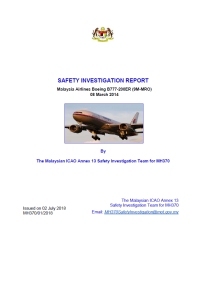 To review the process of reporting system and the action flow when flight crew and cabin crew’s health may become a risk factor for the safety of the aircraft operations. The personnel manning the Flight-Following System/Flight Explorer should be adequately trained and qualified to enable them to provide information relating to flights to the relevant authorities and/or organisations. The current Flight-Following System/ Flight Explorer should be upgraded to the Global real-time Tracking System. To review and introduce new security measures for cargo scanning at Penang International Airport/all airports and the point of entry into airside at KLIA/all airports. A document back-up system should be implemented on every training sorties, simulator trainings, and flight trainings completed by a trainee should have their original form submitted to the Training Department and a copy retained by the trainee in his personal training file. To develop a comprehensive Quick Reference for the Operations Control Centre that covers every aspect of abnormal operations/situations. To review and introduce new security procedures for the scanning of cargo at the point of entry at all airports and the point of entry into the airside at KLIA/all airports in Malaysia. To review the effectiveness of current ELTs fitted to passenger aircraft and consider ways to more effectively determine the location of an aircraft that enters water. 09 AUG 2012 9M-MRO Malaysia Airlines contaced the tail of a China Eastern Airlines A340 (B-6050) at Shanghai-Pudong International Airport, China. Wing tip of B777 severed. Distance from Kuala Lumpur International Airport to Beijing-Capital Airport as the crow flies is 4392 km (2745 miles).